A successful website design is the result of a pool of skills including business awareness, graphic design and user experience modelling. 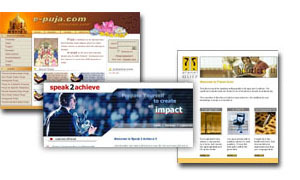 Our web design team has substantial commercial experience in developing and establishing on-line brands. The designs we create are unique and will help you differentiate your site from your competitors on-line. also important to get navigational and interface factors right, so that the visitor stays and gets around the site easily. believe a site should be accessible from the homepage in a single click.